I actually have a bunch of art supplies I don't really use, so I embraced the oppurtunity to have a drawing date with Josh! We put on one of our favorite shows in the living room, cleared off the kitchen table and filled it with art supplies! We got to drawing and testing out what we got today. I ended up drawing a cute girl (of course.) and had a lot of fun experimenting with the coloring! I highly recommend the Strathmore Sketchbooks because the colors don't bleed through to the next page at all. I'm always looking out for things like that, and I'm also super picky about the paper I use. It can't be too thin or too thick. I like the official feel of Moleskine sketchbooks, but I have to admit I always get worried about really sketching on the paper because it's so nice. I always want to draw more worthwhile things and avoid sketching and I don't think that's a good thing at all. 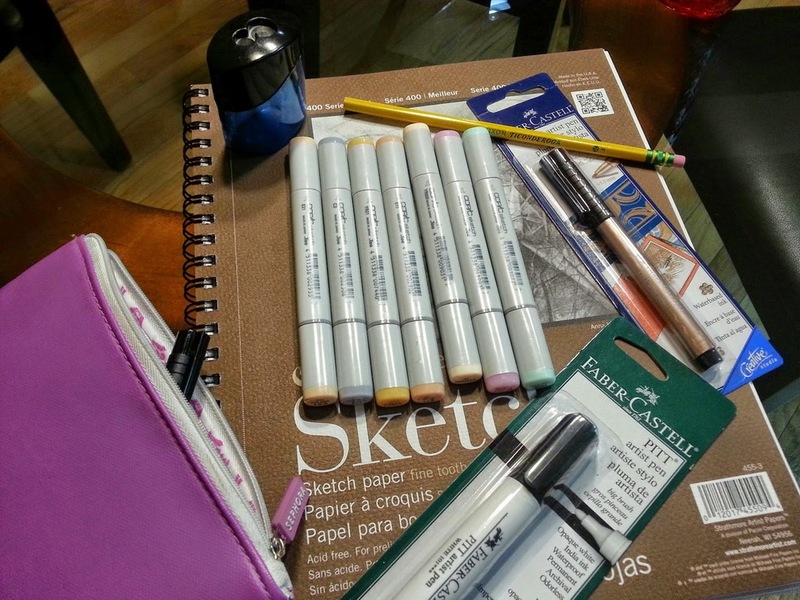 This sketchbook makes me want to sit down with my art supplies and go crazy with them! I got to draw my cute Kate Spade purse I bought the other day, too. Last night I got to sketch a bit before bed to help tire me out. It didn't work XD I wanted to practice my chibis because I see how cute other artist's make them and I've always felt weird about my chibis. I know I need to do more digital artwork and practice with that, but coloring traditionally is too much fun! I always tend to draw myself wearing a hoodie but I tried to get out of my comfort zone with that and actually drew a pretty dress instead. I want to try to draw more varied fashion choices, so that's something I'm working on as well! You can get a glimpse of where I keep my Copics here as well as some of my chibis. I'm going to scan better versions of them and keep them away for a project I would like to work on over the summer. Remember how I said I wanted this blog to be like my sketchbook? Well, I would like to have a site dedicated to my sketches and actual illustrations instead of just putting them on Flickr like they are now. But that's something to start compiling and reporting on when more is actually planned out. I'll keep you all updated!